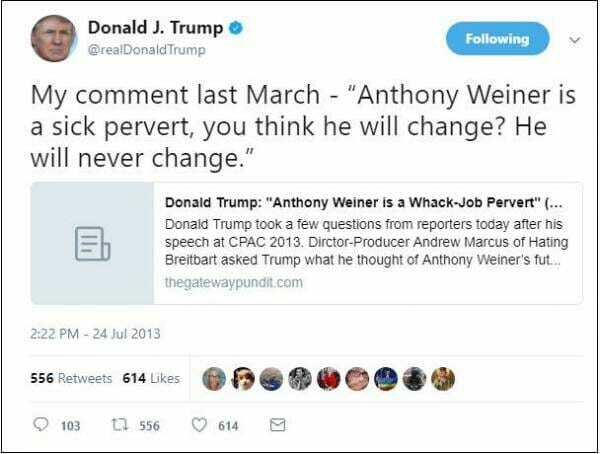 FLASHBACK: Donald Trump References Gateway Pundit in 2013, Says "Anthony Weiner Is Sick Pervert - Will Never Change"
Back on July 24th of 2013, now President Donald Trump tweeted out a link to a Gateway Pundit article referencing a comment he made about pervert Hillary Clinton surrogate Anthony Weiner. The comment, which read: “Anthony Weiner is a sick pervert, you think he will change? He will never change,” and predated most of the scandals that would come to embroil the “whack-job pervert” Anthony Weiner and his Clintonite associates. Just today it was announced that Weiner would receive a 21-month prison sentence for sexting with a minor. Though the penalty is considerably lighter than it should be, Weiner is finally facing justice for egregious behavior. Who would’ve guessed, all this time, that President Trump was so prescient?